KP Financial Services draw for Apple iPod was drawn independently by Seamus Campbell, Chairperson of Carrick-on-Suir Business Association on 28th August 2013. 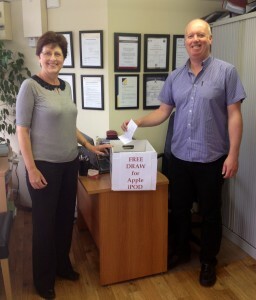 We are delighted to announce the winner is Faye Newport of Kilrane, Co. Wexford. All Entries were taken recently at the Iverk Show, Piltown.